memcached is a general-purpose distributed memory caching system originally developed by Danga Interactive for LiveJournal but now used by many other sites. It is often used to speed up dynamic database-driven websites by caching data and objects in RAM to reduce the number of times an external data source (such as a database or API) must be read. Here we describe the options available from the command line to control a memcached instance via unix socket or IP:port. Memcached can be set up to either take control commands via an IP address and port or via a unix socket. When listening via IP:port by default memcached listens for connections on port 11211 and accepts connections from INADDR_ANY. To prevent possibly malicious access you may want to consider restricting connections to an internal or firewalled connection. Alternatively you can set memcached to only listen for connections on localhost - i.e. the server running the instance of memcached using 127.0.0.1.
memory is the maximum number of megabytes of memory you want memcached to use. If you want to specify a different port to listen on use the -p PORT option. Alternatively you can use unix sockets to communicate directly with the memcached instance. In this case commands can only be sent from a login shell that has access to the socket file - for example if you ssh into the server hosting it. 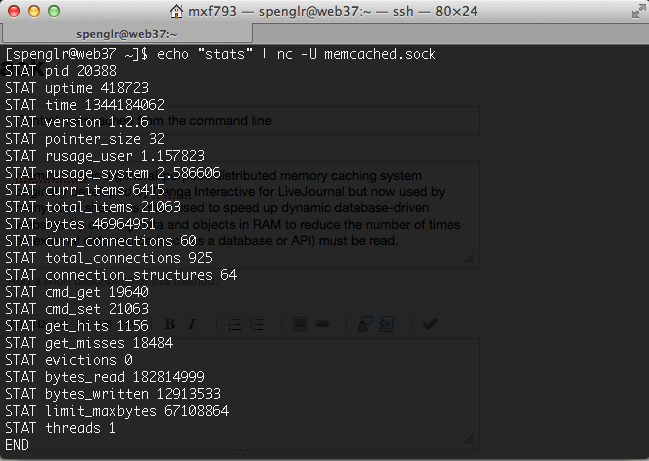 This will create a file named memcached.sock in your home directory to communicate through. Memcached comes with a number of useful management commands. Of these the most frequently useful are flush_all and the stats commands including stats, stats items and stats slabs. Will output a list of stats for the current instance. Additional information can be found using stats items to give total stats about items stored in the cached and stats slabs which provides more information including performance hints.